Here's my card for this week. I made it using the Card Positioning Systems sketch from this week. I only had a few Memory Box stamps so I hand wrote the sentiment. ps....got your message--I'm really sick! Too much singing let my throat get sore and then Trav saw white specks on it! BOOOOOO! So now I'm on medicine and can't swallow! MIIIIIIIIIIISSSSS my Ash:) As soon as I can talk--I'm on skype! Hope you are doing well! 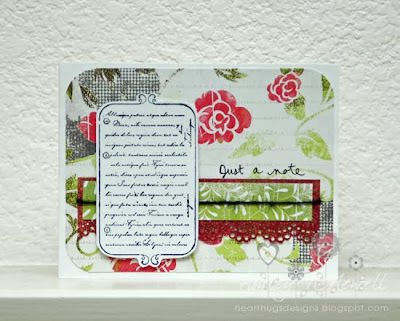 This is gorgeous...love the beautiful papers and how cool to write the sentiment....it looks awesome!! !